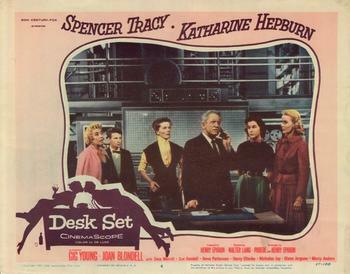 The eighth of nine pictures together, Desk Set is Kathrine Hepburn and Spencer Tracy’s last romantic comedy and first film in color.With a giant computer and the full skirts that the office ladies wear, one would think Desk Set runs the risk of seeming dated. But they’re called classic films for a reason- there’s always something that will ring true no matter the age. So, while computers are no longer the strange invaders of the workplace they were in the 1950s (or even the 1980s), Desk Set’s themes of technology versus the human mind are relevant, fun and funny still. When Richard Sumner (Spencer Tracy), methods engineer and inventor of an “electronic brain,” is hired on at a New York broadcasting studio to help the research department become more automatized, he’s not allowed to tell anybody what he’s really up to! But a strange man who talks about a stranger machine is sure to raise a few eyebrows, and the ladies who work in the research department under the capable Bunny Watson ( played by Kathrine Hepburn and based on Agnes E. Law, CBS’s then-head research librarian) are no dummies.Something is up, and fear of pink slips in the offing! Most of the movie is spent with the not-getting-any-younger Bunny Watson vacillating between trying to get her boyfriend of seven years to finally pop the question, and trying to keep her subordinates calm with the threat of being replaced by a mchine hanging over their heads. Add in Tracy’s geeky engineer’s growing attraction to the head researcher, and a supporting cast of Gig Young and Joan Blondell, and you have the recipe for one charming movie-date. Adapted from a Broadway play of the same name, the part of Richard Sumner was expanded and modified in order to make the story work as Hepburn and Tracy vehicle. This included changing the role from a young man to suit the fifty-something Spencer Tracy. A romance story line was also added. One of the new scenes included a rainy night at Watson’s apartment and some hilarious ad-libbing on the part of the actors. Despite such changes, the audience definitely feels the film’s theatrical roots, and not always in that charming manner much of Desk Set exudes. The camera almost never moves, giving us the same feeling as when theatre-goers are watching a whole stage. The set dressers take try to advantage of the static feel, with props that fill the entire space, such as the colossal EMERAC computer, or Bunny Watson’s office plant. But we miss the intimate moments more fluid camera work could bring. Some might find Desk Set almost forgettable, despite its strong leads. It lacks the battle of the sexes storyline that made sparks fly in Hepburn and Tracy’s earlier films like Woman of the Year or Adam’s Rib. Still, as good as those films are, I personally do not mind. Instead, we get something new, both from the leads and from the relationship they create for us on screen. Though both characters are strong, smart and successful people, the conflict and the attraction never centers on this fact. Both are allowed to remain strong, smart and successful. With older characters, and different circumstance, the romance is slower, but no less lovely to watch.